at the United Nations-mandated University for Peace, San Jose, Costa Rica, 6th-9th September, 2006. Dear Participants of our 7th Annual Conference of Human Dignity and Humiliation Studies at the United Nations-mandated University for Peace, San Jose, Costa Rica, 6th-9th September, 2006! We had a wonderful conference in Costa Rica! 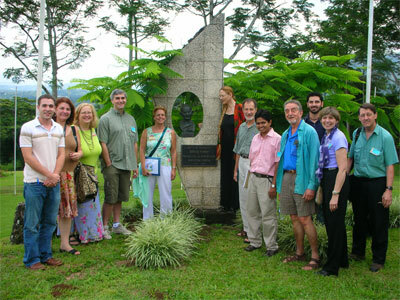 May we express our sincere gratitude and appreciation to all who joined our 7th Annual Conference of Human Dignity and Humiliation Studies at the United Nations-mandated University for Peace, San Jose, Costa Rica, 6th-9th September, 2006! We would like to thank our amazing host, the United Nations-mandated University for Peace, San Jose, Costa Rica, with its wonderful UPeace Team, Rector Julia Marton-Lefèvre, Dean Amr Abdalla, Dean Victor Valle, and Professor of Peace and Conflict Studies, Victoria Fontan. Apart from welcoming us most generously on their campus, Julia, Victor, Nick Marton, Azad Mohammad Abul Kalam, and Victoria were furthermore so kind as to open their homes to house some of our participants (Julia and her great housekeeper Maira took warm care of Moira and Stephanie, Victor kindly cared for Pandora, Nick and Azad were generous hosts for Evelin until she moved to Victoria's, after Linda and Rick had left, who had enjoyed Victoria's great home). This was a truly shared effort! Please let us express special thanks to Chrisophter Santee, and Rick Slaven, for caring so wonderfully for us, and making us all feel safe! Our warmest thanks also to Linda Hartling and Donald Klein for setting the frame of appreciative inquiry. Donald Klein again moved us all deeply on Thursday morning. He shows us how to live in what he calls 'awe and wonderment'. The setting as well as our small number of participants at the UPeace campus provided a beautiful and more intimate environment which allowed for a sense of connection and informality even greater than in previous conferences. The use of the Open Space Technology was utilized in such a way that facilitated more exploration of people's thinking and ideas in several areas. For the first time we began to look at how to support Evelin, and build a structure for the future that wouldn't be exclusively dependent on her initiative. Victoria 's presentation was especially powerful and poignant. Evelin's presentation at the Public Event was grounded in her own personal experience and family background, that made her observations and theories especially powerful in a way that I hadn't witnessed before. We couldn't have done this without the role that Christopher played as a facilitator, guide, translator, and interpreter. This was my first encounter with the HumanDHS network beyond my emailing throughout the course of the past few months. I wasn’t sure what to expect exactly, the only perceptions I had came from Victoria, and we had been so busy, I preparing logistics, and she with her UPeace work, and with everything else that she had taken on that we hadn’t had time to discuss. In addition, Victoria’s unfortunate absence created a challenge that I definitely hadn’t anticipated. But in reading the web site, I knew that this group, whoever would arrive, would be composed of flexible, appreciative people, able to co-create an environment for maximum enjoyment and dialogue, which put my worries at ease. I was correct in assuming that the group would absorb the necessary amount of strain to make the conferences run smoothly. Rick’s funding management, Linda’s hosting capabilities, as well as her four-wheeling chauffeur abilities, Evelin’s determination, and of course everyone’s dedication made a truly successful conference here in Costa Rica. 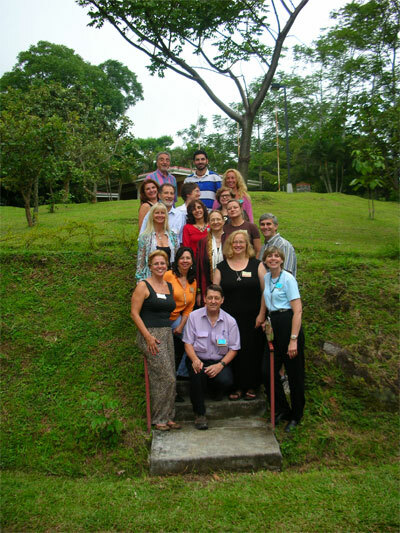 It was revitalising and energizing to be with our group in Costa Rica! I was proud of our collaborative efforts in the face of unexpected events. From my perspective, the respectful, non-dominating leadership style we use during our conferences (i.e., 'walking the talk', which is modeled by members of our group) encourages organisational resilience. With Evelin as our inspirational and visionary leader, it seems like we are co-creating an operating system that is something more than a traditional, functional hierarchy. I like to think that our relationships within the HDHS network are organised in a new way, characterised by mutual empowerment, fluid expertise, flexibility, and shared leadership. Consequently, we have the relational resources to move through unexpected challenges. Each time our group meets, I feel like we increase our capacity to practice an 'ethic of humility'. This creates a unique relational space for all of us to bring more of ourselves into our discussions. Humility helps us get beyond win/lose, all-or-nothing, polarising debates. It allows us to respectfully, honestly, and constructively struggle with different perspectives (for example, our challenging discussion of the George Bush administration). Our operating ethic of humility encourages us to be more authentically engaged and thus more creative in the process of doing this work. I am grateful and inspired by the contributions of everyone who joined us this year--my thanks to all!! I want to especially thank Victoria for making it possible for us to have this conference at UPeace - a fantastic location! Christopher's valuable help with all of the arrangements and conference details was amazing. As always, Don's 'appreciative way of being' sets a tone for respectful curiosity and playful participation. Alan's generous facilitation of the 'Open Space' process makes me think that we should regularly integrate the principles of Open Space into all of our conferences. I loved the introduction to 'Philosophy for Children', that Phil made possible - now I know there is a way to teach critical thinking without triggering humiliation. Rick tells me he has fun playing the 'unconditional supportive partner', but I know he is a valuable contributor to this work, adding to the discussions, managing financial tasks, and keeping us - especially me - laughing. Finally, in addition to the rich conversations throughout our conference, I always appreciate Evelin's opening talk. Her insights continue to strengthen my conviction to help her move this work forward in whatever way I can. Again this year, it was wonderful to conclude our conference with a public event, joining with the students and administrators of UPeace. I was delighted that Victoria shared her latest thinking on 'humiliation awareness as anti-terrorism' - an encouraging, life-saving idea. And, as always, Evelin's remarkable presentation on the 'theory of humiliation' helps everyone understand the global importance of this work. It is always a surprise to me the amount of time, energy and effort that goes into these conferences and how much it brings to me at both a personal and professional level. I was able to do field work, and meet amazing people who added so much individually and collectively. As I said in my closing, what I came away with was hope. Hope that the direction of the world can be altered to a new and more peaceful course. 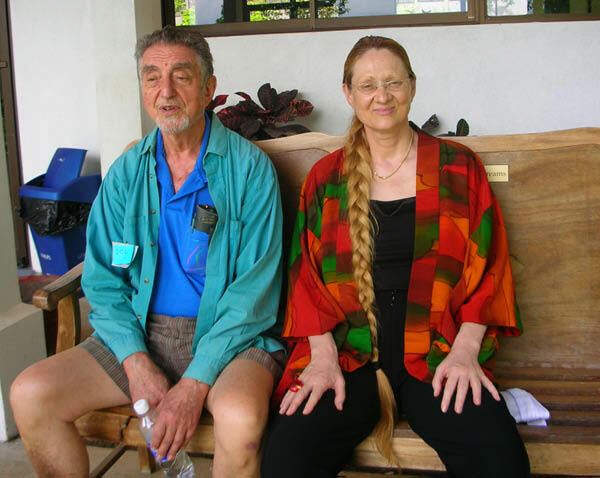 I am hoping to collaborate with both Moira and Phil, and visit others if I am out their way. Unfortunately, due to the costs of travel, I won’t be able to meet in China, but am hoping our discussions regarding broadcast possibilities may come to fruition. Please, all, keep in touch. We always bond as a group in our conferences, however, in our Costa Rica get-together this was intensified by the beautiful setting in which we met, a space in the middle of lush nature, with dramatic afternoon thunderstorms forcing us to almost huddle together to be able to hear each others’ voices on the background of heavy rain and thunder. In addition, there was the fact that the Costa Rica destination is somewhat off the beaten track, and that we have no funding to provide, which had the effect that only the very determined managed to actually attend. Thus, the setting of the conference, the size of the group, combined with the fact that we dedicated much of our time to the Open Space Technology, facilitated bonding. I would like to first thank Victoria for her amazing work with preparing our conference. We were absolutely devastated when Victoria could not be with us, except for our Public Event. We are so sorry, dearest Victoria, that you were in hospital while we were the beneficiaries of all your great preparations! And your talk in our Public Event was absolutely great! Thanks a million for all you did for our conference! And thanks so much that you “kidnapped” Christopher! With such grace and calm did he keep our conference on track! So wonderfully did he reply to the myriad of questions, and responded to all the smaller and bigger problems that arose! Christopher, we hope you know that we think that you are quite a genius! Julia Marton-Lefèvre, Victor Valle, and Amr Abdalla deserve our warmest gratitude for hosting us so warmly and generously at UPeace. Their care and support were deeply encouraging for our group! We all wish to extend our sincere appreciation to you, dear Julia Marton-Lefèvre, Victor Valle, and Amr Abdalla, and I think I can say that in the name of our entire group! For me it was particularly nice to meet Victor again, whom I met for the first time in 2001, in NY. He wrote a fascinating paper, Spiraling in Human Insecurity: The Historic Evolution of a Country, which he presented to the Expert group meeting “Structural threats to social integrity: Social roots of violent conflict and indicators for prevention,” 18-20th December 2001, United Nations, New York, NY. This meeting was organised by the Social Integration Branch of the Division for Social Policy and Development, Department of Economic and Social Affairs United Nations, New York. Dear Victor, you told me in NY that I had to come to Costa Rica, and I did! And it is great! Due to your great hospitality! 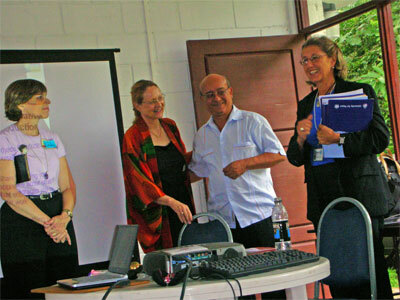 As in our past conferences, also our Costa Rica gathering was a collaborative effort of shared leadership. Always Linda holds our conferences, and she does this with her wonderful gift of weaving different elements of our program together, while keeping part of her attention on the entirety of our effort. Linda and I, we are usually extremely exhausted after our get-togethers, not least because we never relax fully into the moment, but always keep an eye on the bigger picture. I doubt that I would ever survive our conferences, if not Linda were always there to catch what has been forgotten, and do what needs to be done. We are proud of keeping our conferences fluid (our outside-of-the-U.S. conferences are usually less structured than our NY workshops) and be resilient to any changes or “threats” (adverse circumstances or people interfering in less than helpful ways), however, this requires a very high level of concentration, a concentration that is usually invisible to outside observers. I have no words to thank Linda that she shares this burden with me. Linda’s husband Rick, apart from defusing any potential tension with his humour, is always taking on those difficult tasks, such as collecting the money that needs to be paid, and in these ways is of tremendous help. He also contributes with deeply insightful comments and reflections that remind us that he has such an important background as an educator. We always value you and your contributions extremely highly, dear Rick! Don again and again elevates us on a higher level of being, with his vast life experience, and his deep thoughts. He not only speaks about awe and wonderment, he also brings awe and wonderment to the world, to the participants of our conferences, and to me. I feel that listening to Don is like standing on top of Mount Everest and being overwhelmed by the beauty of the view, feeling eternity near, and all worries fade. So easily we, as human beings, are overwhelmed by the details of our lives – Don makes us lift our eyes to a wider horizon of meaning and fulfilment. He is right, why should we not always have the sense of awe that we have when we watch a sunset? Why should we allow our lives to become petty and smallish? He teaches us to be free, and focus on what makes life worth living. Martin Buber differentiates I-Though relationships from I-It relationships; in I-It relationships the other is regarded as an object within a setting of utility. We wish to include all people (and also animals) into our circle of living creatures that “deserve” to be addressed in an “I-Though” fashion. Just to give a trivial example: when a waiter in a restaurant puts a cup of tea in front of us, we try to look into his or her eyes and express our thanks; in other words, we attempt to refrain from communicating with anybody as if they were robot-like providers of services. In his introductions to our Open Space sessions, Alan showed exactly this kind of consideration for the fact that relationships need to be nurtured actively and consciously, instead of expecting that they occur “automatically” (something we are mislead to believe as long as we move only in contexts where people get together because they are paid for it). Never should we stay in the “bubble” of our own needs (“give me sugar,” “give me salt”), and disregard the humanity of a fellow human being, not “even” a waiter in a restaurant or the cleaning lady in our hotel room, let alone our fellow HumanDHS group members. Thanks most warmly, dear Alan, for your willingness to be with us! I think that I can say that in the name of everybody! However, we had one problem. Usually Becca, Alan’s daughter and Don’s granddaughter, is with us in all our conferences. For the first time, she could not join us, because she began her studies at Tufts University, and could not be away. Our conference felt “wrong” without her! We missed you a lot, dear Becca! After our conference, some of us went for a post-conference trip to the Caribbean, to Cahuita, about 3.30 hours from the UPeace location, where we stayed for two nights (10-11th September). The following day, some of us went to the Poas volcano and to Sarchi (12th September). After many days of maximum concentration, I so much enjoyed not being in charge. I stopped making an effort of thinking straight, which sometimes amounted to acting rather stupid. I am glad that Alan (who was my main target, not least because he sat in front of me in the bus) did not lose patience with me when I asked – just to illustrate the degree of my mental laziness – whether the house he had seen on sale was costing 150,000 USD or Colon. He patiently explained to me that we would buy many of these houses if they were costing only 300 dollars! Thanks, dear Alan, for your endurance in front of me enjoying asking so many unintelligent and hilarious questions! Please let me now return to our conference. Phil had participated earlier in our NY workshops; however, in Costa Rica he took on a more central place and role. He is a master of what I call “brilliance and humility.” He clearly does not stay within the bubble of his own needs, he always observes, scans, and monitors the needs and states-of-being of those around him. I feel that he has the amazing talent of continuous “group empathy” and humiliation awareness (a term that Victoria has coined). In our earlier conferences, he stayed more in the background; however, in Costa Rica he became much more active. He went from observing to translating these observations into action. It was deeply touching and gratifying to me to have the privilege to observe this transition, and be part of his contributions to our conference. Phil invited icohere and Philosophy for Children, and this was very enriching. We hope that many decades with fruitful cooperation with Phil will lie ahead! I thank you personally very much, dear Phil! When I think of Ragnhild and Anne Katrine, I see two Nordic queens in front of my inner eye! I am part of Ragnhild’s life since more than ten years – in other words, our relationship predates HumanDHS. It was therefore particularly significant for me that Ragnhild joined our conference. I would so much like to have her meet our entire network and hope therefore that she will be able to come to future gatherings so as to meet also those members who could not come to this particular get-together in Costa Rica. After all, we are around 300 people in our network by now! What touched me deeply was Ragnhild’s recognition and validation of the fact that I personally seem to have covered a long path during the time we know each other. This path enabled me to facilitate the emergence of HumanDHS. What was furthermore deeply touching not just for me, but for everybody, was how Ragnhild spoke to us through her singing. Ragnhild filled the room with the most powerful awe and wonderment, so potent that we all were shattered. I could not speak after her song on our first day. Later, when she included all of us into her singing, in a circle, a different kind of group power emerged, something I have never experienced just like that ever before. I am so grateful that Ragnhild came to our conference together with Anne Katrine! You both contributed with so many wonderful insights and reflections, and our ethical commerce conference was so extremely encouraging, that I have no words to thank you both, dear Ragnhild and Anne Katrine! I look forward to another lifetime of synergy and cooperation! Amy came with her daughter and this was great. I feel that it is part of “walking the talk” and appreciative being to be inclusive and appreciative of our entire life span as human beings. It was great to have you both with us, dear Amy and Megan! For me, what really made me very thankful and happy, was how Amy took charge of our e-journal. It is great that Victoria is our editor, and that Amy has agreed to be her co-editor! Work is always lighter when shared! Also your contributions to the topic of shame and humiliation was great, dear Amy. We all thank you most warmly for your caring presence and your most insightful contributions! It was particularly rewarding for me to finally meet you in person after so many emails! 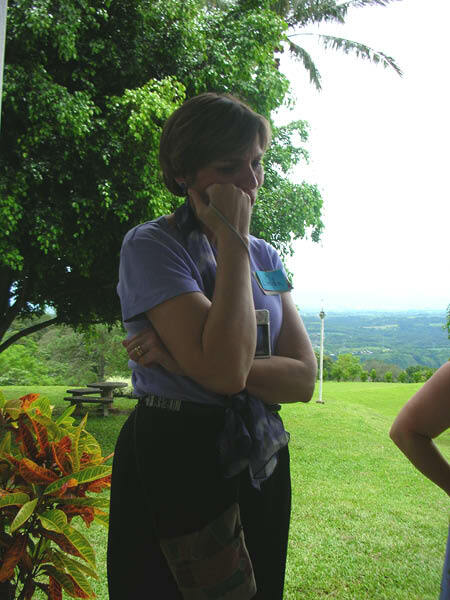 I met Moira in person for the first time when she participated in our NY conference in December 2005. We all were very impressed by Moira and her wonderful way of being and we were therefore deeply thankful for her offer to be part of our Research Advisers Team. It is a pity that Maggie could not come from the UK, because I remember that you two had such a good mutual contact in NY. I hope, dear Moira, that you felt that our Costa Rica conference was inspiring for you even though there were not so many opportunities for discussing research? Our NY conference is always closer to traditional academic conferences than our outside-of-the-U.S. conferences, which are more geared towards group building, and it was wonderful to have you with us, dearest Moira! Your presence is so valuable! Pandora first participated in our conferences in 2005, in Berlin. It was great to have her again in our Costa Rica conference. With your multicultural and multidisciplinary background, and with your sharp mind and caring support, Pandora, you are such a uniquely valuable member of our network! Please, could we ask you to always continue to be with us and extend your warmth to us and share your depth with us! Myra brought her best friend Margie, and having both of them was great. I would like to see much more of you in our work, dearest Myra! You have so many levels of knowledge and talent, and I feel that we have seen only a fraction so far! I am so eager to see more! I would therefore be extremely happy to have you continue to be with us and contribute with all your wonderful resources, ideas, and creativity! 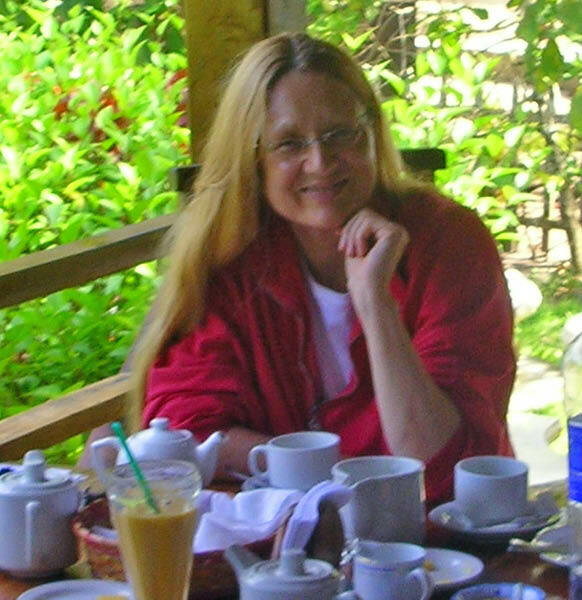 Sharing one’s ideas and becoming part of a larger group is always a process which cannot happen instantaneously, therefore I was so glad to have you with us in our 2005 NY conference and now in our Costa Rica conference, two so very different kinds of gatherings, dear Myra! I would like to extend a very warm welcome to you for continuing to be with us! And, dear Margie, what a wonderful new member of our network you are! Another warm welcome to you! Your expertise and your caring presence were invaluable! We so much look forward to having you continue taking part in our activities! Dear Sibyl, I guess that particularly our emphasis on “walking the talk” must feel a bit strange to you; I assume that this kind of self-reflexivity is not what philosophers do, since it may “smack” too much of “soft” psychology? Or is my view of academic philosophical debate too prejudiced? May I extend a very warm welcome to you, dear Sibyl, to be a bridge in our network, a bridge from the rigour of sharp philosophical conceptualising to the recognition that some kinds of self-reflexivity need to be part of this rigour, if we are to be serious about dignity? As you will see in our NY conference in December, this conference will be much closer to traditional academic settings than our outside-of-the-U.S. gatherings usually are, and it would be wonderful to have you continue giving us your most enriching presence! It was a pleasure to meet Marta for the first time, after so many emails! Meeting face-to-face is such a different experience! Now I really understand your background, dear Marta, and the vision that you have for your future, and I am so glad that you joined us. I guess, as for Sibyl, many aspects of our conference must have seemed unfamiliar to you. Sibyl is usually surrounded by colleagues in academia, while you, dear Marta, work with the corporate sector. I guess that people in the business world might be even less inclined to engage in self-reflexivity? I value highly your decision to give your life a new direction, and it would be wonderful to have you in our network as a bridge to precisely the corporate sector, whose role is so significant in today’s world. It was great to have you in our Open Space session on ethical commerce, dear Marta! 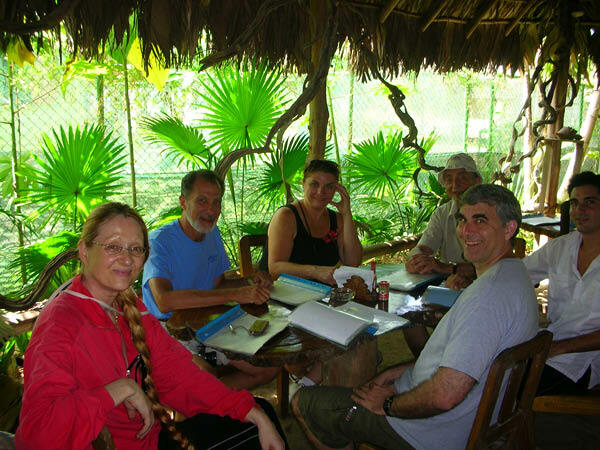 And it was just perfect to share a room with you at Cahuita, and explore the Poas volcano with you after our conference! A million thanks to all your care and support, dear Marta! I met Stephanie in Norway, many years ago (I wrote down the date: 11th September 1999). We kept in touch, and she first participated in our Paris conference in 2004, followed by our NY conference last year. Her’s is one of our “success stories,” since she linked up with Bob Fuller in our Paris conference and took off creating her own book I Feel Like Nobody When … I Feel Like Somebody When …, inspired by the work on rankism by Bob, and by our group’s work. For me, it is an invaluable gift to see Stephanie take our group as a platform to unfold her wonderful talents and do such important work. It was good to hear that she was able to even work in Costa Rica, at a school, prior to our conference, collecting children’s stories of when they feel they are nobody, and when they feel they are somebody. Stephanie, with your managerial skills, you have saved our conferences in many situations! May we thank you with deep affection for your amazing contributions to our work and to the world! We look forward to many decades of cooperation and synergy! It was a particular pleasure to have Nick and Azad with us on our conference! What an honour to have two future Presidents with us! Nick’s contribution to our conference was invaluable, not least his great input into the Education session of our Open Space! Dear Nick and Azad, may we invite you to be part of our network? We would be extremely happy! I would like to end this newsletter by thanking you again for all the wonderful mutual support. I think there was nobody who did not contribute generously, therefore let me give my warmest thanks to ALL OF US! I very much look forward to our next workshop in NY in December 2006!